It started as a joke. After playing in the orchestra during worship, my dad left the stage and sat down in the empty seat between his best friend and my mom for the sermon. The sermon was boring that morning, so he nudged his friend and whispered, “Watch this!” before reaching over and putting his hand on my mom’s knee. 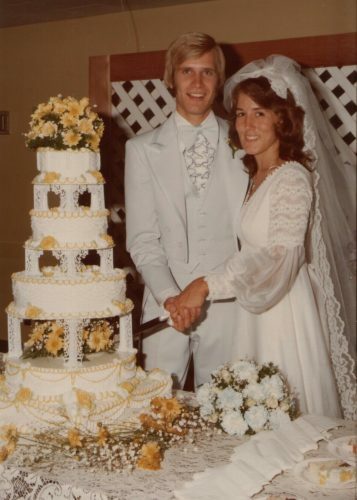 My mom quickly pushed his hand off and scooted away from him as far as she could, but after the service, when my dad asked her to go out with him to Pixie Pancake House after church that night, she said yes. She said yes again at 17 when my dad spontaneously proposed – “Let’s get married” – but they didn’t tell anyone at the time because they were so young; they officially got engaged three and a half years later. They married a few months before they turned 21 and then set off on a 33-day honeymoon around the Pacific Northwest. I was born when my parents were 28; my brother was born a year and eight days later. Since we were young, we have seen how our parents expressed their love to each other. Even though you weren’t aware of it, Mom and Dad, we were watching. Mom, I saw you love Dad by making dinner every night and by having it ready when he got home from work. Dad, I saw you love Mom by coming home from work at the same time every day so dinner didn’t get cold. Now that you both are retired, I still see you, Mom, make dinner every night and you, Dad, wash the dishes. I didn’t understand it then, but I now see how the small, everyday routines of life can be meaningful. I saw you go on retreats and vacations without Greg and me. Though we went on family vacations every summer when Greg and I were growing up, I learned from you that your spouse comes before your children and that if you don’t prioritize your marriage, you won’t have much to give your children. I saw you teach classes together, paint the house together, pack boxes together. I saw you play volleyball together when I was young and go to baseball games together when I was older. As you worked together—I’ve always admired how well you do this—and had fun together—you do this pretty well too—I saw you enjoying being together. I saw you united in decisions, about money, about moving, about how to discipline Greg and me. We could see that you respected one another when one of you backed the other up. I read somewhere that the best gift parents can give their children is to love each other. You have given Greg and me, as well as our spouses and your grandson, this gift and have taught Greg and me how to give this gift to our own children. You couldn’t have given us anything better. I am grateful to be your daughter and I love you. Thanks so much, Sue! God gave Greg and I fantastic parents and we are so grateful. Dear Susan, as I reread the blog it made me smile..and laugh. God has blessed us so much. We have so many friends whose marriages didn’t survive, and some who are still married but wish they weren’t. My mom told me marriage was work and I’m thinking ‘it’ll be easy’ but she was right. Some days I didn’t want to cook dinner and some days dad would have rather stayed at work – even now some days I don’t want to cook but I do because dad likes to eat! Each day we start with a hug and a kiss – we still like to date and have fun too! We are blessed by our kids and their spouses and hope we have equipped you both for marriage and life. We are honored to be your parents!